This paper aims to shed some light on the notion of sustainability from an Islamic perspective. It is intended to frame an enlightened Islamic discourse to address global environmental issues. Islam as a way of life is seen as the mercy to all humanity that can provide some remedies and insights to the global debate on progress, sustainable development and good life (Hayat Tayebah). The essence of knowledge, role of human and the environment in Islam will be presented. A framework for sustainability which represents balanced and harmonious progress will be outlined. The 21st century is characterized by a number of global environmental challenges that shaped and defined the discourse and agenda of the West with respect to the developing world and specifically the Islamic world. In this article I intend to shed some light on the global environmental challenges and how Islam can contribute to explain and provide insights to address these challenges. However, in order to define a new perspective and discourse for the future of sustainability and progress, there is a need to define what constitutes a good life (Hayat Tayebah) from an Islamic perspective. Between 1700 and 1980, 1.2 billion hectare of agricultural land was gained at the expense of a roughly equal amount of forest (Richards, 1990). Such conversion involves loss of species and biological diversity which in turn limits the provision of eco-system services. The problem is further magnified due to pollution as a result of land use and ecosystem changes. The conversion of natural areas to agriculture has brought benefits in terms of food production, but it has come at a cost of lost species and changes in ecosystem functions. Part of the problem is that the benefits of agriculture are commercial, whereas the benefits of species diversity do not show up in the form of financial forms. The challenge is that economic approaches are faced with the question of what are the benefits of conservation and what are the economic value of ecosystem services and species. There is a critical need to explain why biodiversity needs to be conserved and what does this mean to the progress of society. Sachs and Reid (2006) argue for the need to invest in ecological infrastructure in poor countries and establish a periodic assessment of the benefits that people obtain from ecosystems. The main conclusions of Millennium Ecosystem Assessment (MEA) are: 1) environmental degradation is a major barrier to the achievement of the Millennium Development Goals. Out of 24 ecosystem services, only the productivity of 4 had been enhanced over the last 50 years. More that 70 percent of the 1.1 billion poor people surviving on less than $ 1 per day live in rural areas, where they are directly dependant on ecosystem services; 2) Investing in environmental assets and equitable strategies are vital to achieve national goals for relief from poverty, hunger and disease; 3) Reaching environmental goals requires progress in eradicating poverty. Major changes are needed in consumption patterns and education paradigms (Al-Jayyousi, 2001, 2008). Also, there is a need to re-think notions of green economy and clean technology, Green Fund for mainstreaming environment in national development strategies, and periodic assessments of MEA and higher prices for exploiting ecosystems could reverse the degradation of ecosystems services over the next 50 years. Islam translates into action, through what he terms “the process of decision-action” as contextualized in Qur’an as faith and good action (Eman and Amal Saleh). behaviors. As a result of the last ice age, a once verdant garden of Eden was transformed into the barren deserts of today’s North Africa and the Middle East, while Europe’s glacier cover to be gradually replaced by thick, fertile forests. I believe that it is enlightening to reflect of the fate of the early hydraulic civilizations where the over-exploitation of natural capital resulted in collapse of empires and nations. Foltz et al. (2003) contributed to Harvard Divinity School publication which attempted to reinterpret Islam from an environmental perspective. This literature focused on the notion of “vice regency” and made a correlation of the Islamic understanding of “justice” with ecological concerns. Erdur (1997) demonstrates how the American environmental movement began as a radical critique of Western modernity and was subsequently absorbed into it. I argue that there is a need to de-construct and re-think the fundamental underpinnings so as to evolve an Islamic environmental worldview that is in harmony with ecology, society and culture. Foltz (2000) noted that the majority of Muslim scholars are more focused on social rather than environmental injustices. He stressed the need to revitalize the Islamic tradition of rational intelligence (aql) as a positive force for addressing the global environmental crises. It is critical, I believe, that both value and aesthetic rationality (norms) are informed by economic rationality (aql) to ensure sustainability and progress. humankind. He also critiqued Darwin’s evolutionary ideas and argued that any environmental understanding founded in Islam must include: the notion of transcendence, a correspondence between the microcosm and macrocosm. This will entail, I think, a transformative education that will develop a story for the creation of universe and human based on Islamic culture and perspectives informed from ideology, epistemology and norms and values. Islam sees the role of the individual as a value-and knowledge creator, a steward, witness, and a reformer who strive to contribute to progress and good life (Hayat Tayebah) (Al-Jayyousi, 2008). To be able to achieve this, we must establish development models informed by both culture and ecology. Islam should be viewed not only as a religion but also as a way of life, a worldview, a holistic culture and a vision of a just and equitable society. Islam also provides new perspectives for discovering and explaining the root causes for the current environmental, economic and social crises as manifested in climate change, HIV, poverty and human security. Specifically, the Islamic perspective is that social, economic and political problems manifested in global poverty, financial crisis, and climate change are indications of market failures. Besides, Islam views the root cause of global warming and ecological crisis is due to the absence or lack of human stewardship and the deviation and departure from “natural state” or Fitra. The objective of this paper will focus on how Islam views the notion of sustainability, as a good indication for progress. This paper argues that Islam should be viewed not as merely a religion but as a worldview and a way of life to address the current global problems including the ecological crises. To address the notion of sustainability in its broad terms we intend to look at the threes pillars of sustainability, i.e, ecological, social, and economic. Progress of societies and sustainability will be framed and defined with respect to four capitals; natural (ecosystems and renewable energy), social, financial and manufactured (technology) capitals. The following section will address the value and significance of incorporating our natural capital (and renewable resources and energy) to measure the progress of societies. It also seeks to shed some light on the linkages and synergy between ecology and culture in the future thinking of sustainability and progress of societies. Nature and ecosystem services underpin all other capitals. Hence, progress means that ensuring the life, functioning and resilience of our nature is maintained. We need to invest in nature to ensure progress since we can not invest on a dead planet. Progress should entail the careful consideration of all capitals. Technology and energy are key components in defining progress. We can envision Islam as the 4th larger virtual layer (which means spirituality) that shape and refine all capitals. The linkage between ecology and culture are evident in the rich use of metaphors and analogies in Islamic culture that relate culture and ecology. Both sources of knowledge in Islam, Qur’an and Hadith, promote reflection open a wide avenue for innovative solutions for real and current issues. The Islamic notion of humankind’s stewardship of the earth entails a profound responsibility. Other living species are also considered by the Qur’an to be “peoples or communities” (ummam; Sura 6:38). The creation itself, in all its myriad diversity and complexity, may be thought of as a vast universe of “signs” of God’s power, wisdom, beneficence, and majesty. Islam is not a new religion but a continuity of Abraham’s message. Believing in Islam entails a belief in all prophets including Moses and Jesus. Islam is keen to enable humanity to see this notion “unity” within “diversity” through promoting dialogue and wisdom sharing between cultures. Qur’an teaches that the whole creation is in a state of prayers (Tasbeeh and Sujood which I call symphony of life) and praises God by its very being (Sura 59:24). According to the Qur’an, the creation of the cosmos is a greater reality than the creation of humankind (Sura 40:57). Islam does view the earth to be subservient to humankind but it should be administered and exploited responsibly. Prophet Muhammad said, “When doomsday comes, if someone has a palm shoot in his hand he should plant it. It is illuminating to reflect on this notion of harnessing every single positive energy so as to green the planet and to invest in nature as part of serving God through environmental stewardship. This example is a good indication for the emphasis on Islam on positive action, hope, and optimism for dealing with ecological risks like climate change, desertification and de-forestation. This positive call should be harnessed to form coalition for a green economy and to establish people-centered development. In Islam, the Qur’an contains many metaphors that link human evolution, history and nature. Conceptualizing society as an ecosystem (not a machine based on Newtonian physics) informs and enlightens our minds, and souls and transforms our worldviews and mind-sets. In an attempt to link environment and culture, Islam draws analogies and metaphors between human and ecology to illustrate notions of renewal, succession and innovation. As articulated by Kiuchi and Shireman (2002), nature is a source of knowledge, a research and development lab with 3.8 billion years of product development. Societies can get inspirations and information from culture and ecology. A society founded on information – one whose lifestyle and ideas reflect the idea that knowledge and design are the root source of value – is where the emerging economies in the South should be heading. Seeing unity within diversity among disciplines and themes of ecology and culture can open new possibilities for harnessing the best of our financial, human and natural capital. In a knowledge economy, businesses and societies run not just on fossil fuels and raw materials but also on ideas, information and inspiration, they begin more and more to resemble the creative systems of nature – systems like the prairie, the coral reef and the rainforest. The patterns and cycles of rainforest, for example, can inform us how phases we see in nature can evolve towards more creative, value creating, and life affirming patterns. The heavy emphasis of the industrial economy on replication tends to cultivate false beliefs about the source of value. According to the machine model of business and society, it is natural to think we create value by taking in resources so as to develop products along with pollution and waste. As we leave the machine economy behind and cultivate a living economy that is informed and reformed by ecology and culture, we discover new drivers for societal values and human transformation. For example, diversity promotes sustainability simply because diversity is choice. The more diverse the organisms in an ecosystem, the more types of resources are available to deal with a challenge, the greater the likelihood of success. Broadly speaking, in the cultures of the north and west, in Europe, industrialised America and Asia, material affluence is vast. Yet the loss of connection to community, and the alienation it brings with it, can erode our own foundations and undermine our culture’s capacity to sustain itself. In the cultures of the south and east, parts of Middle East, Latin America, Africa and Asia, we are reminded of the value of faith, human connection and empathy. Living systems, such as the water cycle, are regulated by such limiting factors as seasons, weather, sun and soil, each of which is governed by feedback loops. Feedback in nature is continual. Such elements as carbon, oxygen and nitrogen are constantly being recycled. Societies and business may not only be informed by nature but also reformed by nature and culture. The Arabic language and the Islamic term to describe this: visible (thahe) is contextualized through nature and invisible (batin through culture and belief system ).. This duality of thaher and batin explains the substance and form of the underlying reality of progress and sustainability. A sustainable society, community or ecology needs an accurate balance sheet that reflects the status of the ecosystem services and enhances the flow of financial, manufactured, human and natural capital. The current economic metrics do not account for the value and benefit for the ecosystem services. The key to sustainability according to Hawken et al. (1999) is to seek that all four capital stockholdings (financial and manufactured, natural and human) are as prudently stewarded. It is believed that the next industrial revolution then, after the digital revolution for is an ecological. The key implications and requirements for this ecological revolution include increased resource productivity, enhancement of flow and service and reduction or elimination of waste. Reducing and eliminating the very idea of waste, can be accomplished by redesigning industrial, or utility based, systems on biological lines. This serves to change the nature of industrial processes and materials, enabling the newly sustainable society to maintain and develop a constant use of materials in continuous closed circles. This entails a new perception of value, a shift from the acquisition of goods to the purchase of services, whereby quality, utility and performance is continually sought to promote natural and social wellbeing. The end of the millennium witnessed three independent processes, i.e, the information technology revolution; the economic crisis of capitalism; and the emergence of cultural social movements, such as human rights, feminism and environmentalism. Castells and Blackwall (2000) argued that the interaction between these processes, and the reactions they triggered, brought into being a new dominant social structure, the network society; a new economy, the informational/global economy; and a new culture. The logic embedded in this economy and society underlies all institutions in an interdependent world. Progress of these new network societies should ensure a balanced use of all capitals including natural capital, social capital, financial and manufactured (technology). Measuring and defining (or re-defining) progress of societies relies mainly on a societal embodiment of a dream that integrates the four capitals. The aim of this paper is to evolve and revive a culturally-based notion for the progress of societies that have resonance to norms and values of Islam. Paradoxically, Islam is currently viewed as a threat rather than a remedy or cure from the fragmentation of knowledge, matter and spirit and human and the community. In this paper, I am arguing that Islam should be detached and analyzed out of the realm of the separation of church and state and the Western narrative of secularization of science and knowledge. In today’s global crises (HIV, poverty, finance, and ecology) Islam can offer a fresh and renewed model for a re-definition of progress of societies. This is attained through the articulation of what constitutes a good life (Hayat Tayebeh) and also part of a larger process of civic renewal (Al-Jayyousi, 2008). In liberal economic theory, happiness was already an economic measurement used interchangeably with utility as well as general welfare. Economists attempt to quantify happiness through measurements in consumption and profits. The underlying assumption is that when societies consume more of a product it means that it is good and generate happiness. It is this equating of high consumption levels with happiness that has been challenged by proponents of gross national happiness (GNH). GNH depends on a series of subjective judgements about wellbeing to address the limitations of gross domestic product (GDP). However, gross domestic product (GDP), remains the dominant indicator of national performance for most developed countries. Measuring progress covers a wide range of attributes which include health, social and spiritual dimensions. A number of experts challenge the GNP as an adequate measure for assessing the progress of societies (Korten, 1995). As a result, genuine progress indicator (GPI) and happy planet index (HPI) were developed as a refined version of GDP to address other dimensions like the state of environment and other social and health aspects. The GPI is an index that intends to reflect the sustainable economic welfare. The formulation of GPI was based on the basics of GDP but modified to address the value of household and community work, and deducts the costs of commuting, pollution, land degradation and industrial accidents. However, the GPI does not account for either the accumulation or decline of human capital (health, skills, knowledge and experience) or social capital as sound and stable institutions and supportive communities. The GPI advocates argue that the GDP commands such overwhelming attention that needs to be replaced by a similar, single measure, which is underpinned by considerations of sustainability. On the other hand, other indices include the Happy Planet Index (HPI) which is a measure that shows the ecological efficiency with which human well-being is delivered. The index is built from three different indicators, two of which are objective: life expectancy and ecological footprints and the third is people’s well-being or “life satisfaction” which depends on the world views and the mental and physical health. Human Development Index (HDI) is another index developed in 1990 and consists of three elements; standard of living, life expectancy, and knowledge. In sum, all what these measures attempt to do is to ensure that markets tell us the ecological and social truth. It is enlightening to realize the historical role of Islamic culture and worldviews in promoting co-existence, socialization of knowledge, and dialogue between cultures. Ibn Khaldoun in his Mukadimmah presented a social theory for explaining the rise an fall of nations during the Muslim rule in Spain and North Africa. He developed a theory of economic cycles which is an inter-temporal analysis of socio-economic and political changes. He also outlined the societal transformation from nomadic (badawah) to urban (madaneyah). Ibn Khaldoun argued that it is the sociological make-up of society which holds the secret to economic growth and decline. An understanding of the interaction between demographic, technological, and institutional factors would provide fundamental insights into societal evolution. Also, of special significance is the notion of Assabiyah (group solidarity, group consciousness) that Ibn Khaldoun introduced to explain social cohesion. Assabiyah is a group feeling and energy that emerges from the unity of social, economic, and political interests. The existing social solidarity is both conducive in providing economic activities and at the same time the pursuit of economic fruits provide further impetus for social binding and synergy. Islam looks upon the challenges of the twenty first century as a crisis of values. It realizes the need to re-examine the foundations on which the entire structure of society is built. The crisis in economic, ecological and political relations is the natural outcome of values and institutions that characterize modern civilization. It is believed that through a thorough understanding of the social values of Islam, set in the context of sustainable development, value-oriented communities can develop (and transform) a creative and innovative approach to the challenges confronting humanity today. Paradoxically, the dominant worldview (in the media) projects Islam as a potential global threat, my intent is to transform this mis-conception and present Islam as a source of remedy and mercy for humanity (Rahma lel alameen) and a way to redefine progress of societies. Islam as a way of life covers all aspects of human life. It regulates the relationships between God, Human, and Nature. It is based on the recognition of the unity of the Creator and of human’s submission to His will. Everything originates from the One God, and everyone is responsible to Him. Human is viewed as a trustee (khalifah) and a witness (shahed). Human role and responsibility is to ensure that all resources, physical and human, are utilized in a reasonable, equitable, and sustainable manner. Islam teaches that nature is created by God (Allah) for the benefit of humans. The relationship between humans and Nature is based on harmony, since all creatures obey the laws (sunan) of God. Humans are urged to explore and utilize the natural resources in a sustainable manner. It is through submission to the Will of God that peace is brought about. Harmonization of human’s will with the Will of God leads to a responsible and balanced life. Every human activity is given a transcendent dimension; it becomes sacred, meaningful, and goal-centered. Islam does not approve the useless cutting of trees and bushes. Man can use their fruits but he has not the right to destroy them. Nor does Islam allow waste among even lifeless things, to the extent that it disapproves of wasteful use of water, even if there is no scarcity of water. Its vowed purpose is to avoid waste in every conceivable form and to make the best use of all resources. Humans have been endowed with countless powers and faculties. They possess intellect and wisdom to achieve balance in this Universe. Their very life and success depends on the proper use of these powers. God has also provided humans with all those means and resources to make their natural faculties function and to achieve the fulfillment of their needs. The environment and surroundings contain resources that are harnessed for humans. Qur’an teaches that human beings from all faiths and nations should cooperate and exchange knowledge and wisdom (Hikmah) to establish a better and prosperous life. The proper use of human’s powers implies the attainment of benefits to public or what is referred to as “construction of the world (Emmartu al Kawn). Every other use of resources which results in waste or destruction is wrong and unreasonable. In this paper I argue that the Western model which is based on market economy and consumerism as a means for the pursuit of happiness had failed people, nature and economy. It failed people since we live in a world where there is 1 billion people who live in extreme poverty and that the top 200 wealthy people have more income that 2.5 billion inhabitants. It failed nature since we are experiencing species extinction, loss of forests and the global warming. It failed economic development since it created an artificial meaning for development and progress that resulted in collapse of financial markets and promoted arms race and became addicted to oil. Hence, there is a need to re-think the current western model and evolve a new model inspired from Islamic culture. In an effort to shed some light on how Islam as a way of life sets a framework for a good life and enoughness (Zohd), I will discuss a framework for a sustainable development inspired from Islamic values which looks at the four components that constitute good life and progress. These include justice, excellence, family-community values, and limit of corruption. Justice (adl or Mizan) which corresponds to cosmic, ecological, human justice and harmony in the Universe. Hence, good and ethical governance is the cornerstone for attaining and sustaining progress and thus good life (Hayat Tayebah). 2. Excellence (Ihsan) which means inner beauty, excellence and conscious evolution of individuals, organizations and society (Ummah). This also entails the continuous improvement and value and knowledge creation for all humanity. Family-community values (Arham) which refers to the social networks from family to neighborhood and the global human community at large. Islam teaches that all people were created from different nations so as to be able to achieve “social learning and intelligence” (Le ta’arafu). Limit mischief and corruption (Fassad) which is an indication for the deviation from natural state (Fitra) and the balance that was created by God. This imbalance was attributed to human-activities that do not consider ecological and ethical values. These notions from Islam can constitute new parameters for progress of societies. Transforming Islam to a knowledge-based and diverse worldview will help both our ecosystems and the global community. The Islamic value system establishes clear relationship between finite, mortal human beings and the infinite Divine, the secular and the sacred. Oneness (tawheed) or unity of God and submission of human to the Creator are the foundations in the Islamic belief system. Hence, humans are created to play the role of a witness and steward. Islam, as a way of life expects human beings to conserve the environment, since the environment is God’s creation. The creation of this earth and all its natural resources is a sign of God’s wisdom, mercy, and power. The environment contains God’s creatures which Islam teaches that these species resemble human communities and also deserve protection (Hima). Besides, Islam promotes the notion of good (khair) and protecting environment is viewed as good. It should be noted that the schism between the spiritual and the “scientific” was imported into the Muslim world when the material, industrial culture was introduced, effectively separating the political system from the traditions of the community. This had a devastating effect on the indigenous culture and the environment and its biota. Despite the fact that Islam’s attitude in the theoretical environmental debate is evident and documented, many parts of the Muslim world are currently witnessing a cultural environmental divergence. This was attributed to the fast introduction of the industrial age to these countries without regard to local value systems. 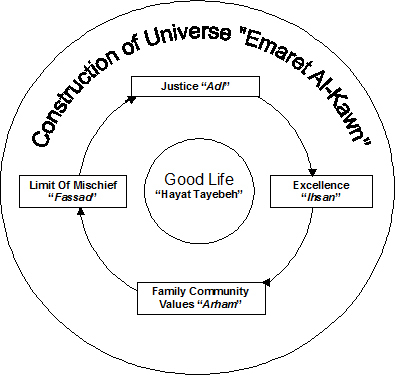 Hence, Islamic values and industrial values need to be re-examined to ensure a value system that fits current realities and contexts that is informed and inspired from Islamic values of justice (adl), excellence (Ihsan), community-values (Arham) and limit of corruption (fassad) as outlined in the model in Figure 1. It is imperative for all Muslim scholars to purposefully apply innovation (ijtihad) and seek sustainable solutions for people and nature that transcend the existing economic model. The western model of economic development with its free market economies, political, economic and social institutions created a number of externalities and environmental costs. In the name of development, local and indigenous people are deprived of their rights in the developing world. Rights and natural resources of local people are taken away and substituted by needs that are defined by the west. As argued by Sardar (2006), no matter how you define and redefine development, how you rework it and rethink it, it just does not fit non-western countries; and when it is imposed on them, it fragments, dislocates, and destroys societies based on traditional worldviews. The high cost and irreversible environmental costs of the market-based economic model is evident. It is argued that markets do not tell us the ecological truth and that risks from climate change and global financial crises are evidence of the market failure. Re-defining the basic notion of “what constitutes a good life” and how to pursue happiness are critical in understanding sustainability from an Islamic perspective. The notion of progress and pursuit of happiness (or Hayyat Tayebah) from an Islamic perspective is about adding value to life through good deeds and knowledge as part of human role in the construction of universe (Imarat al Kawn), helping others, bringing up good children, and also about living lightly on earth (Zohd) and elimination of waste and over-consumption (israf). The Islamic dream is not linked to accumulation of wealth and living in luxury but rather on conserving the human, social and natural capitals which are considered as necessities (darurat). A key pitfall of the western models of development undermines communal existence by suppressing tradition, breaking up rural communities by promoting urban development, increasing insecurity by displacing traditional agriculture and debt finance. What turns development into sustainable development, is the principle that it should meet the needs of the present generation without compromising the ability of future generations to meet their own needs and also to ensure inter-generational equity. It is insightful to know that life enhancing tradition has always been about preserving resources. Hence, Islamic values, local knowledge and practices can be viewed as a model for sustainability, progress and good life (Hayat Tayebah). Islam represents the cultural authenticity which means deep respect for norms, language, beliefs, knowledge systems, and arts and crafts of all people – the very factors which provide richness and meaning to people’s lives. The following is a brief outline on how Islam looks at progress as manifested in the three pillars of sustainability (environment, social and economic). The most interesting feature of the worldview of Islam is that it presents an interactive and integrated outlook. Therefore, a contemporary understanding of the notion of public interest (maslaha) may lead to a theoretical understanding of sustainability in its broader terms. Islam represents the natural state (fitra) or the intrinsic state of goodness. The natural state (fitra) implies a full harmony with nature, people and the built environment. It also means a full realization and consciousness of the role of the human as a trustee and a witness (khalifa). It also enables the human to adhere and appreciate all forms of reform and enlightenment that are inspired by and are in conformity with Islam. Islam offers an eco-cosmic meta-narrative of the origin of universe and human. The story is simple and compelling. The earth is created for the benefit of human beings. Humans are trustees (khalifa) to make sure that all resources are used in a sustainable manner. Islam views the potential risks of climate change as a problem of absence of human trusteeship which is referred to as mis-chief (fasad). Islam looks at species as nations like humankind. Reading Quran informs the mind and the soul that our natural capital and social capital are interconnected and inter-dependant. Islam teaches that species including plants and wildlife are in a state of prayers (tasbeeh). The harm of any species means that we are disrupting the symphony of life and silencing worshipers. Qur’an elevates and deepens the notion of aesthetic intelligence, bio-mimicry, and learning from nature. Both Qur’an and nature contain many signs (ayat) that demonstrate and offer insights and guidance to nurture naturalistic intelligence, innovation and learning. The notion of ihsan means the inner beauty, continuous improvement and consciousness. Ihsan is a key concept in Islam which is the driver and fuel for human stewardship, responsibility and excellence. 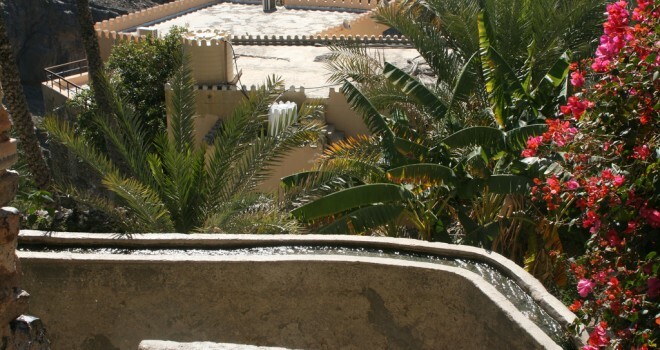 Zohd means living lightly on earth which is an Islamic concept that promotes conservation and rational use of resources. Waqf which is endowment fund resourced by civil society and private sector as an economic tool to ensure socio-economic and environmental security and also as a vehicle to contextualize the notion of corporate social responsibility (CSR) and a value-based organization. Losing the social compass means from an Islamic perspective the lack or absence of embodiment of the teachings of Islam (as a code of reference). This will result in a state of both ecological degradation (fasad) and human and social alienation (taktee arham). The second pillar of sustainability is the realization of the human and social dimension of development. The notion of equity, social justice (adl), public participation (shura) and the deep concern for future generation are cornerstones in Islam. The role of Ummah as a community of practice is to set standards for ethical codes of conduct and also to create new knowledge based on the values and public interest. Within the framework of the Islamic way of development, material and spiritual aspects of life are complementary. To be able to live the good life of devotion to God, we have, therefore, to make the best use of the material resources of our world. Talking about development without considering the spiritual side of people is meaningless; development must preserve the essence of our humanity. Among the dynamic principles of social life Islam has particularly emphasized two – firstly the optimal utilization of resources that God has endowed to man, and his physical environment; and secondly their equitable use and distribution and the promotion of all human relationships on the basis of rights and justice – adl. Care for the poor and the marginalized through sharing resources and financial contribution of Zakat and Waqf a key concept in Islam that need to be harnessed through institutional innovation (ijtihad) and reform of governance. The current global financial crisis along with poverty, HIV-AIDS and climate change challenges compel and incite a dire need for a new economic model that address these global challenges. There is a need to critique and rethink the underpinning of the current market economy that looks at human, nature and culture as a commodity. The main pitfalls of the existing market model are that it discounts the future and is based on compound interest rate and a banking system that encourages loans and over-consumption. When looking at the benefit-cost analysis of climate change, the interest rate (how much we discount the future) will justify the rationality of taking preventive action. In other words, the more the future was discounted the more it made economic sense for climate change impacts to take place. Islamic economics prohibits the compound interest which is the basic concept of the western banking system. Also, Islam provides regulatory framework that ensures the development projects are in the interest for the wider community, not for few individuals. Islam also provides a framework for valuing and weighting interest and value that transcends humans to species and natural resources and future generations. The fundamental concept in Islamic economics is that it prohibits usury (riba) and does not discount the future which implies that fossil oil at the present is not discounted in the future and hence Islam limits over-use of fossil oil and hence contributes to limit CO2 emissions which causes climate change. Unlike the existing banking system which encourages loans and mega-projects that exploits our natural capital. Islam encourages small-scale development which will result in lessening the distance that goods are transported and hence lowering of greenhouse gas emissions and the ecological footprints in the business sector. Today, while we are witnessing the global financial crisis, Islamic economics in its profit-sharing and absence of usury provides sound constraints to prevent borrowers from running into un-payable debts whilst encouraging wealth to be distributed evenly. This in turn will help to contribute to a greener economy that is reformed and transformed by Islam. Islamic civilization and culture redefine the notion of good life (Hayat Tayebah) according to their notions like Zohd which means enoughness and living lightly on earth and Ihsan which means inner beauty and excellence. The western life styles and standard of living and consumption patterns produce high ecological footprints in terms of consumption of food, energy and goods. Through global trade we are outsourcing development and environmental costs across borders to India, China and other parts of the world. The scale and intensity of ecological degradation (which Islam refers to as fasad) in the last five decades is unsurpassed in the history of humanity. There is a need for a macro-shift in our worldviews; a re-thinking of the fundamentals of the western economic model to ensure a humanistic and sustainable model that resonate with culture and ensures balance (mizan), social equity (adl) and respects harmony between nature, people and markets. Above all, what is needed is a new and fresh look at Islam as a source of both inspiration and restoration of the natural state of humans as referred to in Islam as fitra. In sum, Islam offers new perspectives for defining progress and sustainable civilisation that is based on social justice and quality of life rather than unlimited individual accumulation of wealth. Hence, what becomes important in the new Islamic vision of the future is personal transformation of a balanced and harmonious human (annafsu al motmaennah) rather than a consumer who strives for material accumulation. Simply said, the Islmic model or paradigm is focused on expanding human empathy not territory. For Muslims, progress implies that the human is to be free and to have access to rich and diverse relations with others (le taarafu) or what I call socialization of knowledge among all cultures worldwide. The new Islamic model focuses more on attaining a good life (Hayat tayebah), quality of life, and interdependence. It is critical to synthesize and combine all the above Islamic notions so as to develop new metrics beyond GDP, like the Hayat Tayebah Index (HDI) to measure the progress of societies that include happiness, family values, social learning, universal peace (Rahama le alameen), green and clean economy. In conclusion, Modern physics and Realtivity theory informed us with the 4th dimension, Time, which transcended the classical Newtonian physics. Islam, I believe, can provide the 5th dimension for seeing new perspectives of life, like progress, justice, peace and sustainability for both humans and nature. We all have a responsibility to evolve and co-create new models for progress of humanity through purposful efforts that enhance deep undertanding, interpretation and application of culture and ecology. Al-Jayyousi, Odeh. R. (2001). Islamic principles and Dublin statement, Water Management in Islam. Editors: Faruqui et al. 2001. United Nations University Press, IDRC. Al- Jayyousi, Odeh (2008). The State of Ecosystems and Progress of Societies. Statistics, Knowledge and Policy. Measuring and fostering the progress of societies. OECD. Castells, M. (1996). Rise of a network society. Oxford, Blackwell. Foltz, Richard. “Is There an Islamic Environmentalism?” Environmental Ethics 22, no. 4 (2000): 63–72. Hawken, P. and Lovins A. and Lovins L. (1999). Natural Capitalism, Rocky Mountains Institute. CO, USA. Kiuchi, T. and Shireman (2002). What we learned in the Rainforest: Business lessons from nature. Berrett-Koehler Publications Inc. San Francisco. Korten D. C., (1995). When Corporations Rule the World. Berrett-Koehler Publishers, Kumaian Press. Millennium Ecosystem Assessment (MEA), (2005). Ecosystems and Human Wellbeing. Synthesis. Island Press. Washington, DC. Richards, J., 1990. Land transformation. In the Earth as Transformed by Human Action. (Eds. B. Turner, H. Clark., R. Kates., J. Richards., J. Mathews & W. Meyer), pp. 163-78. Cambridge University Press, Cambridge. Sachs, J. and Reids D. (2006). Investments Towards Sustainable Development. Science, 312 (2776): 1002. The World Conservation Union – IUCN (2006). The Future of Sustainability. Gland, Switzerland. Nasr, Seyyed Hossein . “Islam and the Environmental Crisis.” In Spirit and Nature, eds. Steven C. Rockefeller and John C. Elder, 83–108.